Thought I'd share my hobby of painting locomotive drawings. The drawings are my own work. I create fantasy schemes of fallen flags, and existing railroad schemes. Here's a small sample. CB&Q EMD GP38-2 in the black/gray scheme. I changed the gray nose stripes to white. I think it contrasts better. 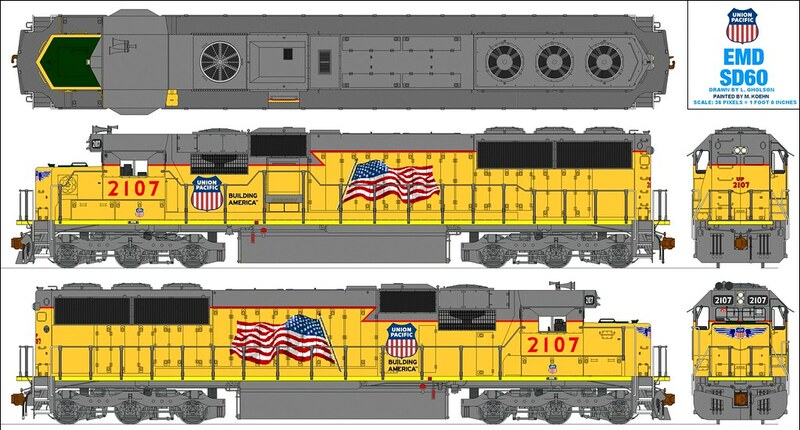 Next is an SD60 is CB&Q's Chinese red scheme. And third is SSW GP60 9703. The drawing depicts the way the prototype unit looked in 2008. I have yet to add some weathering to it. Its always nice to imagine what could have been. 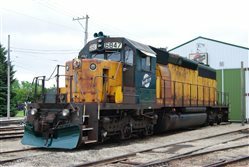 The SD50\60 was a good looking locomotive that probably would have done a lot of classic paint schemes justice. Nice work..keep it coming. I wonder would SSW have adopted “Speed Letting” for the Cotton Belt had SP kept SSW as a subsidiary into the 1990s? It would be neat to see a speed lettered Cotton Belt logo. I wonder would SSW have adopted “Speed Letting” for the Cotton Belt had SP kept SSW as a subsidiary into the 1990s? 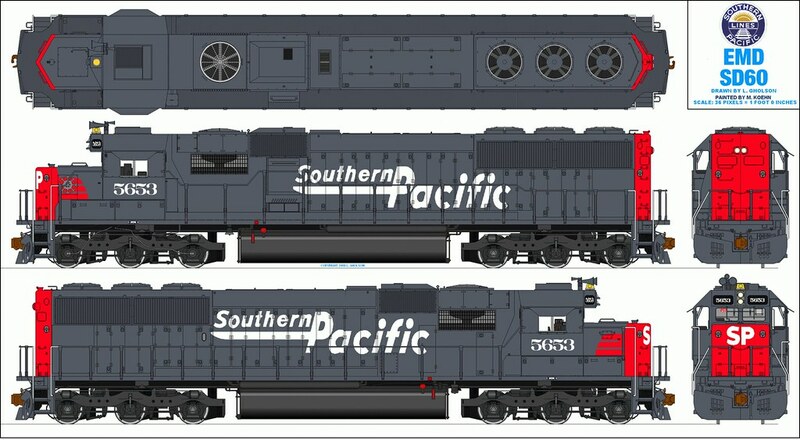 The Cotton Belt (SSW) remained a wholey owned subsidiary of the Southern Pacific until 1992 when it was consolidated within the parent company (SP). In 1996, Union Pacific absorbed the entire Southern Pacific operation which, by that time, also included the D&RGW. Very nice, how long does it take you to do one of these? "It's a great day to be alive" "Of all the words of tongue and pen, the saddest are these, It might have been......"
Depending on the paint scheme and how much time I have, it can take a few days to a few weeks. They purchased RGI which was the parent of SP (and what was the D&RGW). The D&RGW had already been fully merged into the SP by the time Uncle Pete came to the table. Perhaps it would've looked something like this??? Woohoo! Thanks for starting the party, Larry. It's about time everyone saw your work! Like Larry's SP SD60T, I went with the speed lettering scheme for this unit. Tried to keep detailing close to how SP painted their GP60s. You know....I was never keen on MoPac painting their SD50s in UP colors. 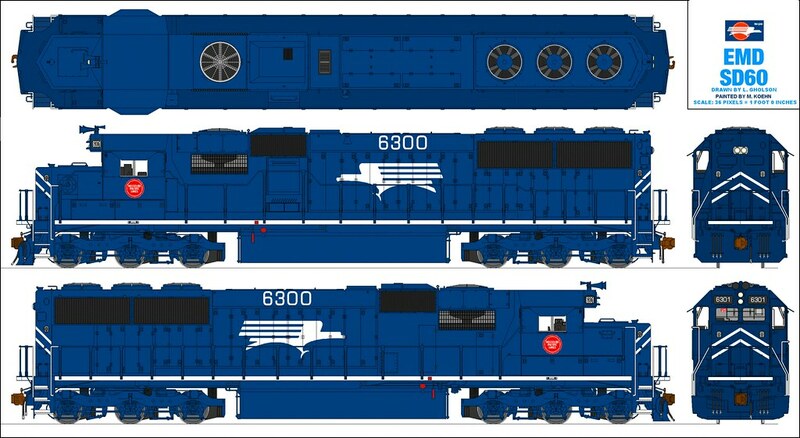 So I went ahead and gave an SD60 some more traditional MP colors. This particular unit would've been what CNW 8007 became if the lease hadnt expired beforehand. This may seem unusual for me to give a UP unit an ex CNW number, but that's only because I gave this unit plenty of additional detail. Miniwings, flag, Z stripe. So it actually looks good instead of that boring-as-dirt red text scheme that all of UP's SD60s wore. How bout some regional love! This is one of my favorite paint jobs too. The scheme takes to the long SD60 quite nicely! It's too bad IAIS probably won't lease any that the class 1s returned. Nice!!!!! We'll have to keep this thread going. I have alot more to post when I get time. So what kind of paint are you using for these? Looks like oil based. Are you painting them digitally or one masonboard or what exactly? Just curious. I used to draw locomotives when I was under 18. Perspective is tricky when it is a 3/4 view, so is scale. Where did you get the unpainted drawings? Thanks. You can tell me if I am being too nosey here. I just started my own website with it's own discussion forums. Not railroad related. I am a computer programmer right now. So one last question, so are you digitally painting these with Photoshop CS4? Photoshop Elements? what package. Again, no interest on my own of painting locomotives just curious in the graphics package. So the graphics package is what I am really interested in here BUT for another purpose. I tried Photoshop Elements a little with my website theme (background) and it worked pretty well with blending colors. Again, if you don't want to answer thats fine....just curious. Very nice! I especially like the E-bell on the cab there. That was clever and an interesting idea. I used to paint Mike's drawings as well. But I've come to enjoy Larry's larger scale drawings with multiple angles more. Still Mike does some really neat work! You guys used MS PAINT!?!?!?!?!? Man, I've done some in there using that link given a few threads up and they never looked that good. I mean besides my stupid paint keeping it in .gif format so the colors are off. I started having trouble getting the basic non-painted wire frame saved in a .jpeg or .btmp so I could use the color charts supplied from that site and not be off but no real luck. I really like that MOPAC one, almost makes me wish they lasted lol. You have to save your blank outline drawing as a 24-bit bitmap, otherwise the lines will shift color. Same goes for your pained versions. If you paint a drawing, then save as a jpeg or gif, the colors will be funky and distorted. The solution, keep all your drawings as 24-bit bitmaps. They are larger in file size, but they retain proper color and quality. To share on the internet, just convert them to jpeg using a photo editing program.I use a free program called PixResizer. It's free and easy to use. To archive the originals, and to save disk space, convert them to a zip file. 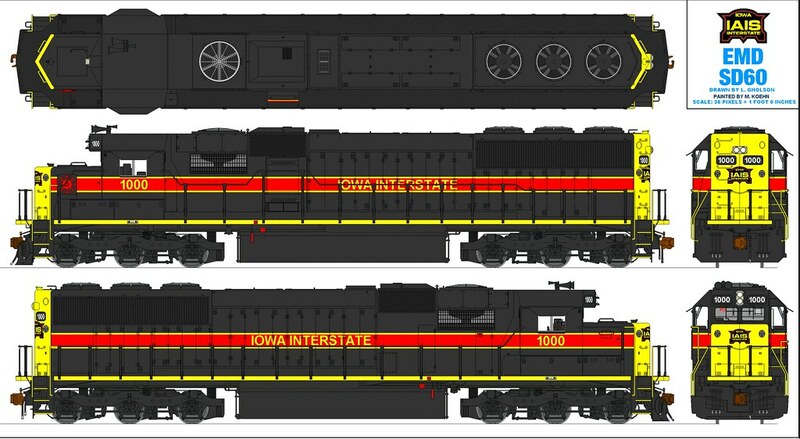 Here's a Rock Island "what-if" with a modern boxcar.